The desire to write properly about Tim Sherwood runs strong but will have to wait for a sufficient sample. For now, we can note that the 4 goal first half salvo against Sunderland has single-handedly lifted their seasonal raw conversion rate (goals to shots) above 6%, a rate which is no longer cut adrift as historically terrible and is merely very bad. I can speculate that a little attacking intent can go a long way at the bottom of this league, and that may well be enough to garnish enough points, but I suspect that an in-form good team may be able to exploit Tim’s functional 4-4-2. These three points so kindly donated by Gus Poyet were clearly vital given that Villa look as though they will struggle to get another away point this season: trips to Utd, Tottenham, City and Southampton await and their survival will likely be determined at Villa Park. It’s interesting to note that in the nascent world of football analytics, we often see counter-narratives growing alongside traditional reactive media or in-game views in relation to the successes or performances of any given team. This season has seen the marvellous dichotomy between Villa’s early successes, subsequent contractual beano and the underlying structural statistical truths that pointed out, quite vividly, that retained success was something of an unlikely longshot. 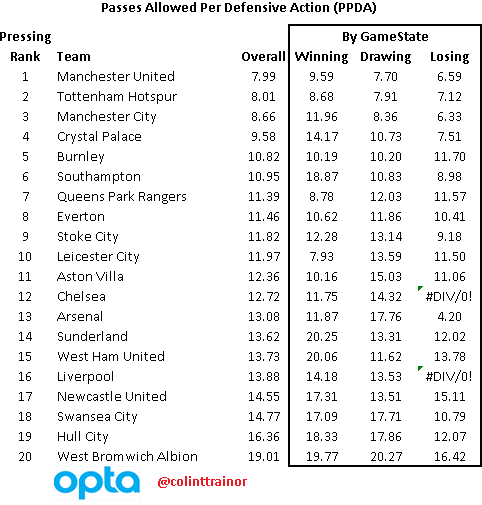 We can also point to one game, a huge outlier amongst Man Utd’s season, their 3-5 defeat to Leicester as a game pivotal to both teams’ wider perception. It seemed feasible at the time to presume that Leicester were coping well with life in the top division, but just as with Villa, the stats told a different story: they were conceding heroically large quantities of shots and had scored nine of 16 shots on target, an unsustainable figure that sure enough did not sustain. 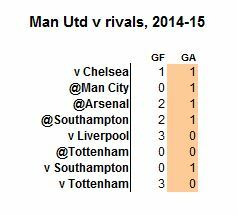 Subsequently, they have plodded, rarely been destroyed, yet picked up two wins in 23 games. Leicester are simply not very good, they never were very good and sadly for them the Championship beckons. What that game did for Man Utd was reinforce a wide view that they were suspect defensively. After shipping out a trio of veteran club legends in the summer and making interesting but not entirely convincing replacement signings, they were handicapped by a slew of injuries and Van Gaal’s desire to tweak formations. And this game showed a clear storyline: they were vulnerable. 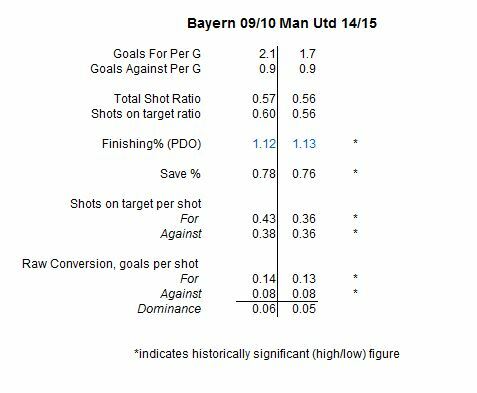 Never mind that they were down a man or that for a team to score from all five of its recorded shots on target was an extremely rare feat, Man Utd were dodgy at the back. 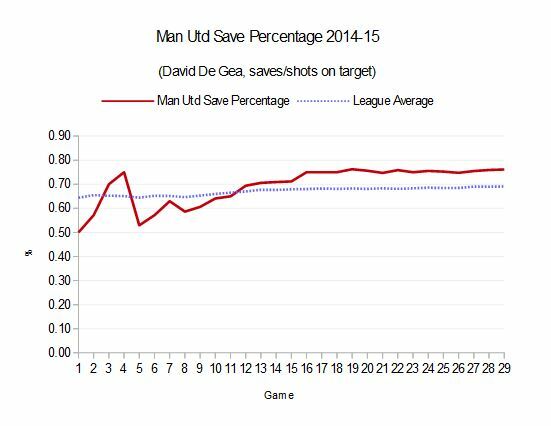 De Gea’s year long save rate is around seven percent above league average which loosely translates to about eight goals. 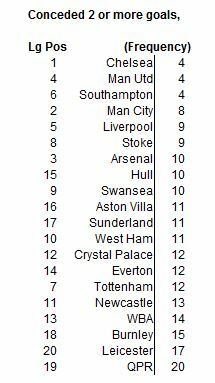 Liberally sprinkle an extra eight goals conceded around their fixtures and their season might look all a bit Moyes. (Last season the rate was 71%, lesser but indicating other issues at play). So here we are: they have rarely looked convincing, there’s sufficient reason to think that their current position is flattering yet they continue to post largely good results and are bizarrely two points behind Man City. They’re just lucky? Hmm… Not so sure. Overall they’ve conceded less than a goal a game; a feat that Van Gaal has achieved in the vast majority of his seasons in management. Sure, he’s been in charge of clubs that were powerful within their leagues, but it implies that limiting the opposition is a key tenet to his work. In fact, as a bit of a curio, there are interesting parallels with the last time he took control of a giant club: his tenure at Bayern Munich that started in 2009-10. And that year, Bayern only conceded two or more goals on five occasions… We’re down the rabbit hole here! It has been well reported that Van Gaal’s methods are extremely prescriptive and team-orientated, so it should come as no surprise that aspects of his statistical map are replicated. What i’m trying to show is that beyond the unsustainable high save percentage, there seems to be a strong system that is designed to effect defensive solidity, and it’s working. Chelsea and Southampton have been the obviously strong defenses throughout this season, but Van Gaal has managed to install a formidable defensive base. If only he could get his attack functioning too. And he did! Tottenham’s kind efforts to rehabilitate the unwanted stars of rivals teams continued apace, as weeks after giving Mario Balotelli a shining moment, Marouane Fellaini surprised the world by sprinting clear of the Spurs defense and finishing handsomely with his wrong foot. A Michael Carrick header and a Gascoigne-esque bundling run from Rooney added to the one-in-a-million nature of the game’s goals and Tottenham left with barely a whimper from their inexperienced line-up. What actually occurred was somewhat typical when compared with other teams that have been unwilling to let Tottenham play their own game. Man Utd’s hard press was extremely effective and once more the central midfield position looked most vulnerable, as horribly exemplified by the Rooney goal. I’m still happy to forgive Bentaleb for reasons of age and general competence but dearly desire an upgrade on Mason, especially when factored against Morgan Schneiderlin’s continued quality in the heart of Southampton’s team. Certainly Man Utd clicked, and whilst he may never be a Van Gaal ‘type’ player, it was disheartening to see Juan Mata line up; he’s had many a good game against Tottenham over the years. Meanwhile, concerns about rotation and tiredness were probably valid. Sadly, but inevitably, this appears to the the end of the road for this season and the team is actually three points behind the Villas Boas/Sherwood train wreck from last year. Progress? I would say so, but more in terms of the distant future. The usual blend of tricky sales and hopefully choice recruitment is once again required this summer and whilst i’m generally positive, there is the nagging feeling that Tottenham look more like Southampton these days than Southampton themselves.